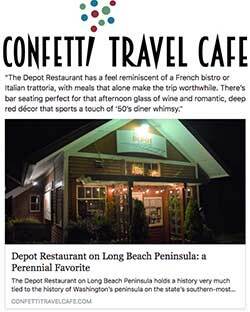 It is rare indeed to find a restaurant as exceptional as The Depot, located in Seaview, Wash. There is a certain paradigm that must exist for absolutely everything to go right, so many factors in the formula that must gel to achieve such sterling results. If even one thing goes awry, I don’t fail to make a note of it. Try as I did to find something that didn’t reach my standards or exceed my expectations, in the end I could not. 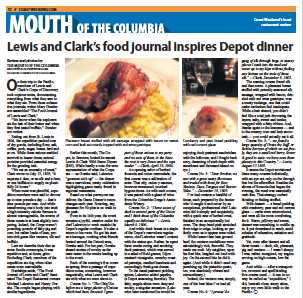 Every moment spent at The Depot was a pleasure, every bite a revelation, and to do justice to my experiences with words is a task I find a bit daunting … but I will try. First of all, the service is beyond reproach, and must be to match the extraordinary cuisine of the kitchen. I’ve been asked what great service entails, and in short I’d say: whatever you want it to be. Some people want to dine formally as if the server isn’t there, wishing to not notice plate clearings and water refills. Others want to engage the server, chit-chat about the menu, the weather, whatever. It is the job of the server to play the role you’re looking for, and feel that out himself or herself. But whatever your desire, you should never be left wanting, never have to ask for anything. A great server anticipates your needs and fulfills them preemptively. They get this at The Depot. 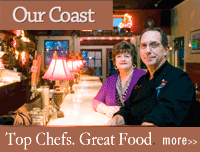 Chef Michael Lalewicz’ food is absolutely unparalleled by any eatery within 50 miles. There is a pristine, unencumbered individuality with regard to both the select utilization of ingredients and their integration and presentation. The menu is relatively small, a plus in my opinion, but exhibits broad palate appeal. Take for instance, the eclectic appetizer menu. The Willapa Bay oysters ($11) offered pan-fried (my favorite) or deep fried with a simple aioli represents the simple, classic coastal dish. Thai calamari ($9.50) with crispy julienned won tons and cilantro peanut sauce over spinach and shredded Napa cabbage is one of the most innovative dishes I’ve had in a long time. What a treat to find a break from the traditional that is so successful. Flavors and textures are unexpected yet perfectly balanced. Peruvian mango sea scallops ($10) were astoundingly superb. Three colossal scallops were cooked perfectly; well seared on the top and bottom with good caramelization, and a bit translucent within. The orange mango sauce and bright green herb oil below and sweet, al dente pickled red onion atop provided a symphonic flavor combo as well as a dazzling, colorful presentation – a triumphant dish that worked on all levels. Pimientos en Tomate y Ajo ($8.50), roasted piquillo peppers stuffed with housemade chorizo sausage and baked with a cumin tomato sauce, was wonderfully spicy and rich; perfect for the cold night on which I ate it. Pistachio panko-crusted brie ($10) was fried just right. A golden brown coating with flecks of green contained a perfectly soft, not-quite-melted ripe, creamy mini-wheel of brie. A side of olive tapenade and crusty and soft baguette slices round out this rich starter. Salads are also first-rate, just the right size and brimming with powerful, complementing flavors dressed lightly. The wilted spinach salad ($5) employs Napa cabbage as well as spinach, and is tossed in a warm bacon and crimini mushroom vinaigrette, then topped with feta cheese and candied pecans. It sounds “busy,” but the flavors play quite harmoniously. The standard Depot house greens ($4.50) is a winning combination of mixed greens, candied walnuts, sliced pears, crumbled bleu cheese and a simple vinaigrette. I recently proclaimed Morris’ Fireside to have the best chowder I’d ever eaten. Now I’ve got a new favorite. The Depot’s chowder ($6.50) is made to order, and every bit as delicious as Morris’, but the leeks and the steamer clams push them over the top. The other soup on the winter menu is Santa Fe Posole ($6.50), a Mexican stew made with hominy, lime juice, tender pork, cilantro and cabbage. Chef Lalewicz spends three days making soup stock the traditional way, pig’s feet and all. The result is quite noteworthy, as I ordered the soup a second time on another visit – a practice I strictly avoid. For all the amazing eclectic tastes of the starters, I was impressed to find that the entrées demonstrate the same alluring culinary diversity as their predecessors, the same careful attention to detail and judicious utilization of ingredients. Chicken Provence ($21), a pan-roasted half bird with thyme jus over porcini mushroom and barley risotto with a vegetable medley, was sublime. Perfectly seasoned and cooked chicken, wonderful pan jus, delicate yet al dente risotto, and some of the best green beans I’ve had in years. The Southern Comfort pork ($29), braised pork shoulder with a tangy barbecue sauce containing the titular liqueur, mashed yams, jalapeño creamed corn and maple bacon salsa, was a whirlwind of comforting flavors. I can see why the regulars have demanded this dish remain static throughout the year. A recent fish special of sole picatta over creamy polenta was top-notch. The lemon, garlic and caper butter sauce was the perfect showcase for sole, which can be bland. Not to be missed are the chef’s desserts. The flourless chocolate torte with whipped cream, caramel sauce and a sheet of ganache protruding like a sail was as beautiful as it was rich and delicious; perfect for sharing. I prefer a less sweet denouement, and found the sorbet duo – blackberry and grilled pineapple on my visit – to be the perfect end. Bravo The Depot! I award you my highest grade.